- influenced by someone - consumer, producer or government - who alters the price/quantity outcome by exercising market power. The Demand Curve for each individual consumer shows demand at each price. At any given price we can, horizontally in Cartesian space, sum up how much all consumers are willing to buy at each price. 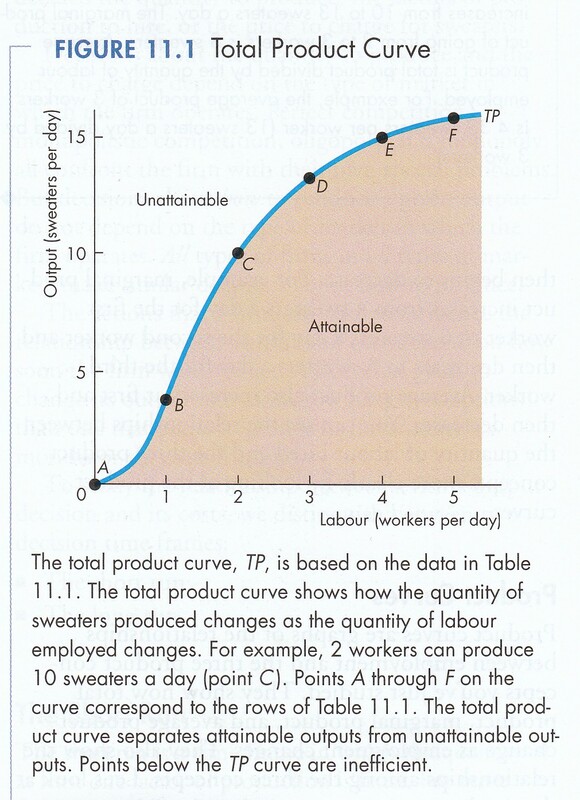 Hence, the Industry Demand Curve is the horizontal summation of the individual demand curves of each consumer. 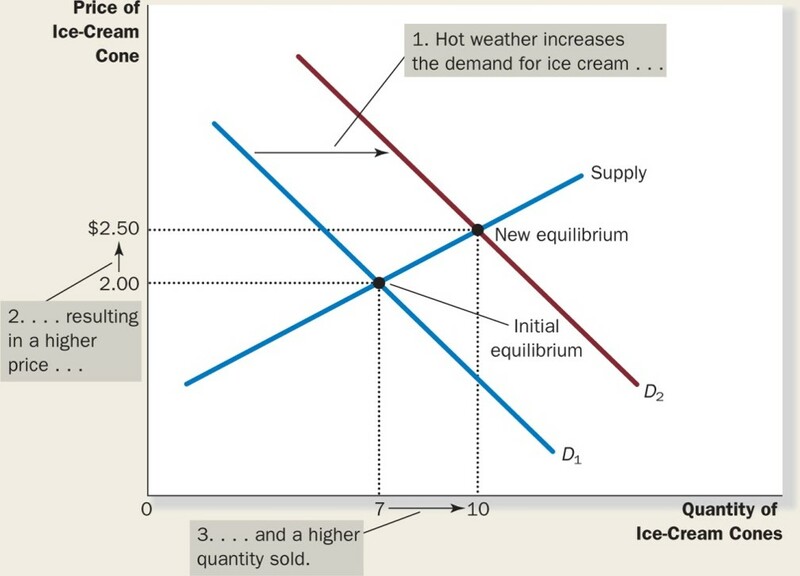 The Market Demand Curve is thus an aggregation of individual consumer demand curves. As will be seen, and importantly, what can be aggregated can sometimes be disaggregated. 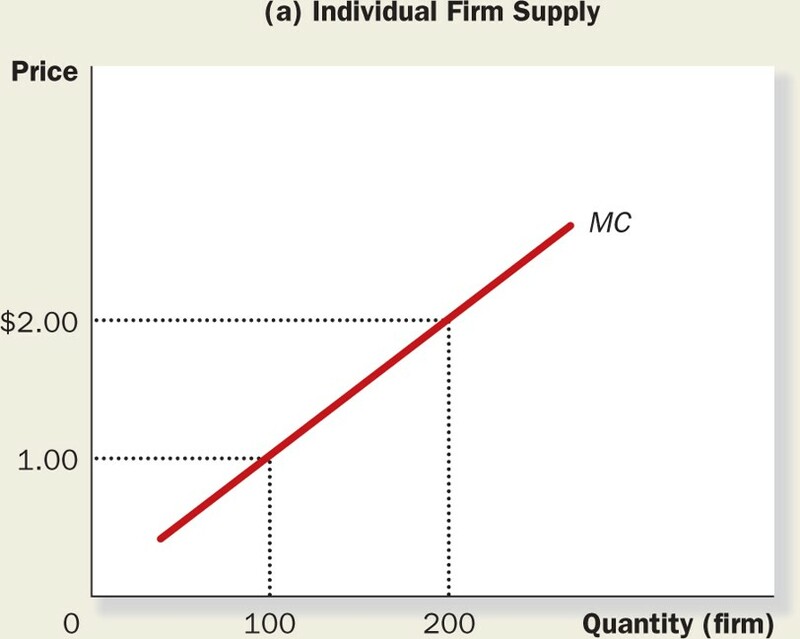 The Supply Curve for individual firms shows supply at each price. At any given price we can sum up, horizontally in Cartesian space, the amount all firms are willing to supply at each price. 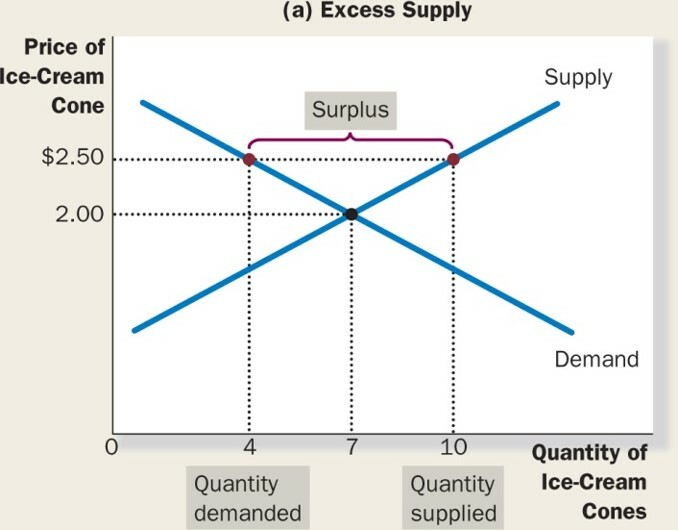 Hence, the Industry Supply Curve is equal to the horizontal summation of the individual supply curves of each producer. The Market Supply Curve is thus an aggregation of individual firm supply curves. As will be seen, and importantly, what can be aggregated can sometimes be disaggregated. All things being equal, the higher the price of a good or services, the greater the quantity supplied. This is the Law of Supply. 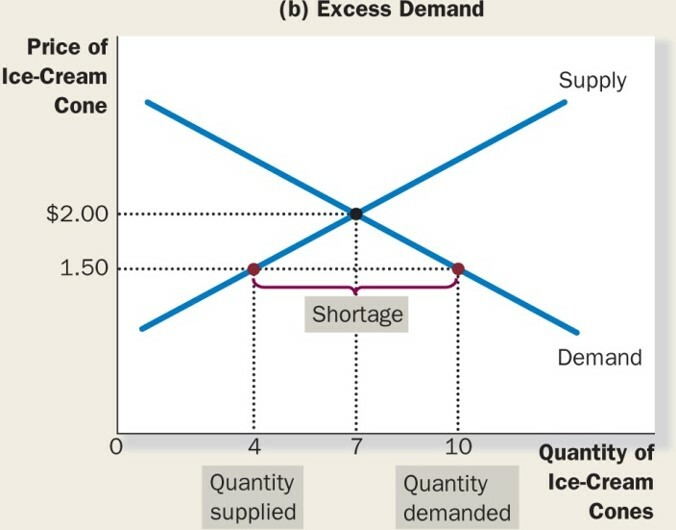 The market demand curve (MKM C7/Fig. 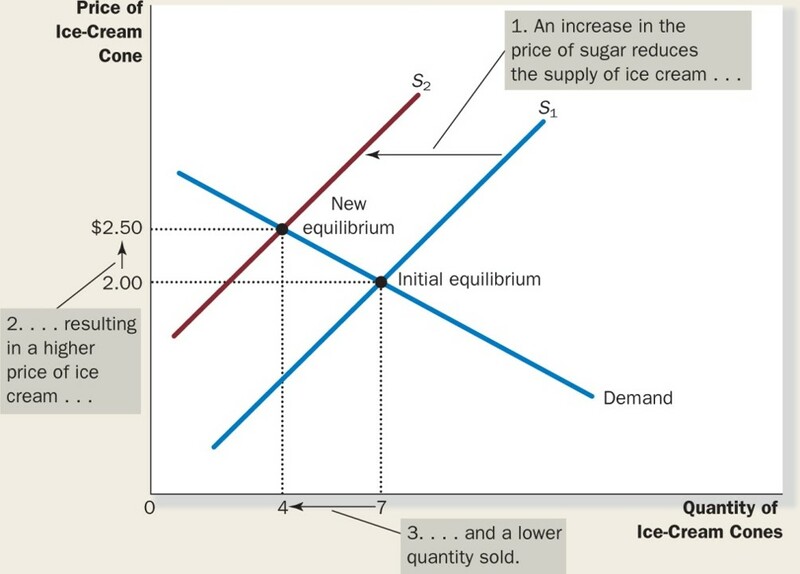 7.7, AB) demonstrates that consumers are willing to pay a higher price for a smaller quantity due to the Law of Diminishing Marginal Utility. 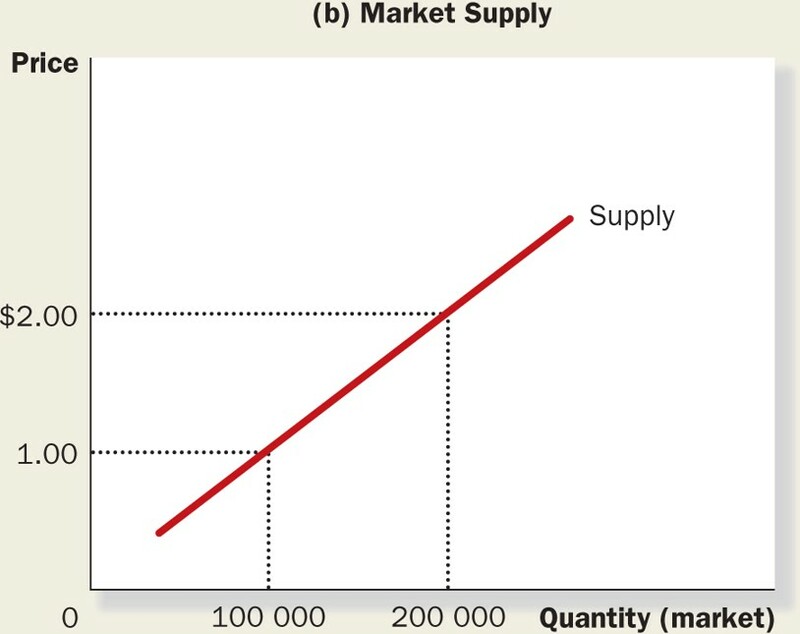 The market supply curve (CD) demonstrates that producers are willing to sell a larger quantity at a higher price due to the Law of Eventually Diminishing Marginal Product. The intersection of the two curves at E sets the market clearing equilibrium price and quantity. For consumers this means that there is a difference between what they were willing to pay for every unit before equilibrium. 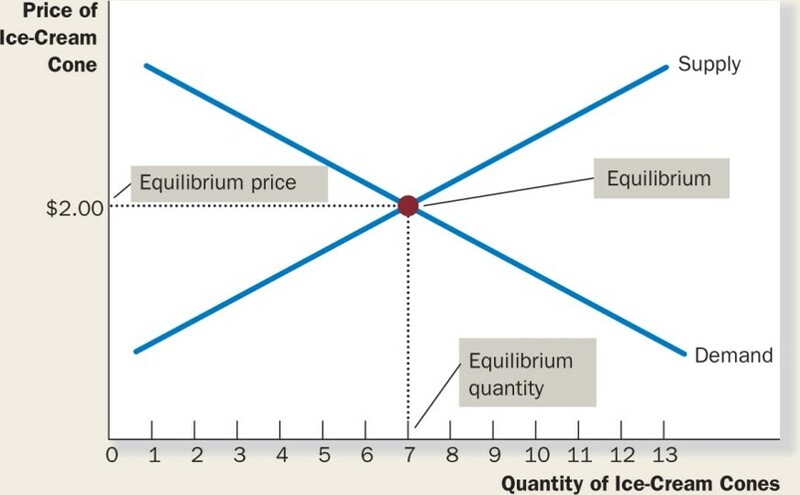 This difference is measured from equilibrium price UP to the market demand curve (AB). It is called consumer surplus. It shows the difference between how much consumers were willing to pay and how much they actually paid. For producers this means that there is a difference between what they were willing to accept in payment for every unit before equilibrium. 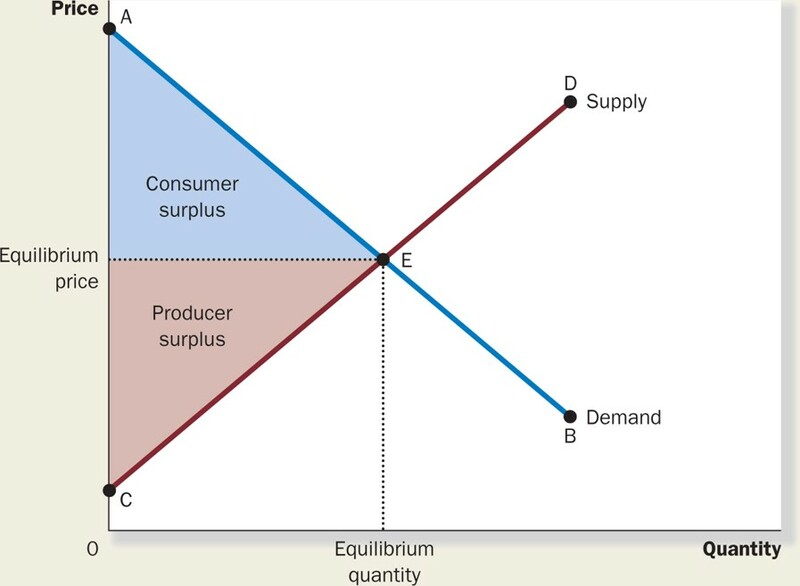 This difference is measured from equilibrium price DOWN to the market supply curve (CD). It is called producer surplus. It shows the difference between how much producers were willing to accept and how much they actually received. As will be seen, under Perfect Competition consumers and producers keep their respective surplus. Under Imperfect Competition, however, market power is used to appropriate part of the consumer surplus into economic, excess or monopoly profits. It is the consumer's willingness to pay a higher price for a smaller quantity that allows Imperfect Competitors to do so. In a Market, price regulates the quantity of goods and services demanded and supplied. If price is too high, consumers demand less than producers are willing to supply. A surplus exists. To rid themselves of this surplus producers lower their price. If price is too low, consumers demand more than producers are willing to supply. A shortage exists. To get more of the good consumers bid up the price (MKM Fig 4.9 a & b). The tendency of producers to lower price faced with a surplus and consumers to bid up price faced with a shortage is called Market Forces. These tend to keep the market price/quantity where ‘X’ marks the spot. Such forces should not be confused with Market Power exercised by buyers or sellers in non-competitive markets.